Six Castlegate provides high quality bed and breakfast accommodation in Cockermouth. 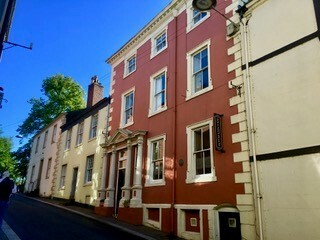 This unique and spacious Grade II listed Georgian town house is perfectly located on one of the oldest streets in Cockermouth, Cumbria. This historic market town is the birthplace of poet William Wordsworth and lies on the fringes of the Lake District National Park. Refurbishment of the guest house has retained many original features and lots of character and now includes modern ensuite facilities with Freeview TVs and wireless internet in all bedrooms. Six Castlegate is an ideal bed and breakfast for tourists, business people and regular visitors to the area; which includes the coastal towns of Workington, Whitehaven and Maryport. WiFi is available through the Guest House. Six Castlegate is a Non-Smoking and Pet-Free House.